Break out of your routine while improving your physical and mental health with these unique fitness options. Like so many things in our daily lives—shuffling the kids from school to activities, meeting deadlines at work, putting a hot meal on the table—exercise can become part of the routine we wish we could skip. The monotony of another day of miles on the treadmill, laps in the pool or reps at the gym becomes a drag on our bodies, leading to a plateau in progress and weighing on our mental state. But fitness doesn’t have to stop being fun. 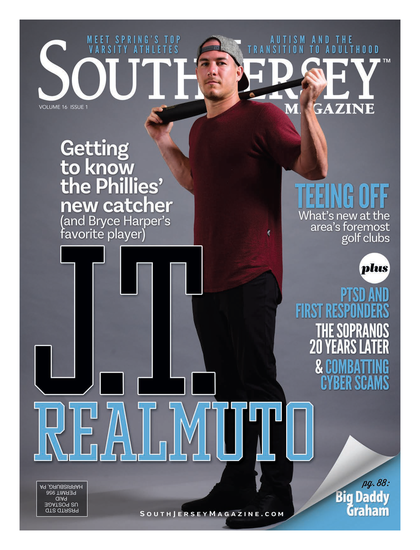 South Jersey has plenty of options to help mix up the routine and challenge your body in new ways, or give it the break it needs while still making you work. Whether suspended in the air with silk fabric or jumping like a kangaroo, these workouts might seem silly or intimidating at first, but they may also become some- thing you look forward to, and you may even find a new favorite. The fastest-growing yoga style, aerial yoga came onto the fitness scene with the advent of Cirque Du Soleil and the mesmerizing acrobatics involved. While suspended in a swath of silk fabric, people move through a variety of postures and stretches are felt more deeply, alignment comes more nat- urally—as opposed to yoga on a mat—and less strain is placed on the joints. The good news is you don’t need to be advanced in yoga to reap the benefits of this exercise. Quite the opposite, actually, says Jane Lewis, owner of You Are Yoga Studio in Cinnaminson. “The silk actually pro- vides more support for people with balance or flexibility issues,” she says. “You are able to do things you can’t do on the mat or floor.” And don’t think you’ll be hoisted several feet in the air. The silk is adjustable and the height varies, with 3 feet being the highest. Aerial yoga offers many benefits, and not just for physical fitness. “Most people are sit- ting or standing all day at work, which puts pressure on the spine. Aerial yoga opens up the spine, decompressing it. It’s better than an inversion table. Everyone walks out feeling wonderful because so many happy hormones are released,” says Lewis. People who consider themselves real athletes could also see their performance improve with the introduction of aerial yoga into their routines. Like Nicole McKee, who has been doing aerial yoga for about a year. The Haddon Heights resident is a distance runner who had never even done traditional yoga before getting into the silk. “It originally appealed to me because it looked like fun, which it is. Additionally, I’ve learned some meditation techniques, learned to be more aware of my breathing and how it affects me. I’ve become more flexible, I’ve had less back and neck aches (they’re almost nonexistent now) and I’ve learned some good stretches to use before and after running to help lessen my chance of injury,” she says. Throughout the class, McKee says her arm, leg and core muscles are engaged. “I know for a fact that it’s helping strengthen my core, which in turn results in being able to run faster. I’ve experienced a minute per mile decrease in my times thus far. I really feel as though it’s a great complement to running for me,” she says. It may feel a little silly wearing special jump shoes, but this workout is no joke. 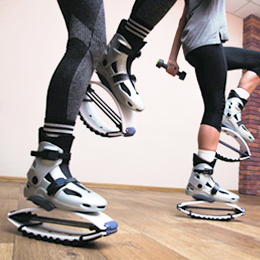 Kangoo Jumps are shoes with a rebounding ring attached, taking all of the impact out of an exercise while bouncing you into the air. Priscilla Tomkinson, owner of Kangoo Club of New Jersey in Strat- ford, says they are almost like moon shoes, but with real athletic value. One class could burn up to 700 calories depending on the effort exerted, says Tomkinson, which is almost equivalent to an hour of kickboxing. “This is challenging because your body is constantly stabilizing on the shoes,” she says, “so you’re burning calories, using your core muscles, improving posture and coordination—everything other aerobics workouts do but on a higher level.” Plus, the boots weigh about 2 ½ pounds each, adding to the toning effect. Kangoo is perfect for all ages and athletic abilities. La’Verne Webb is 51 and stays active with cardio classes like Zumba and kickboxing, and recently started running. She heard about Kangoo through a friend and was skeptical. “Initially, Kangoo was more challenging than expected because I thought the boots were going to be heavy and I did not think I was going to be able to keep my balance while working out,” she says. Webb stuck it out though and takes the class a couple times a week. “The energy is always high and the music is on point.” Better yet, she’s wearing dresses and jeans that didn’t fit a year ago. Channel your inner John Bonham or Lars Ulrich with this full-body workout that feels more like a rock band jam session. Founded by two female recreational drummers, Pound involves drumsticks but no drum set. Drumming is simulated, pounding the sticks in the air or on the ground. At Fuel Fitness in Sicklerville, the 45-minute session fuses elements of cardio, Pilates, plyometrics and isometrics, burning between 400 and 900 calories. Tina Morrison, owner of Fuel and Pound instructor, says the choreography works your arms, legs, glutes—the whole body. “The class really flies by because it’s so much fun,” she says. “It’s a calorie torcher, and after a class, the next day it’s hard to sit and walk.” Coordination isn’t a requirement, she adds. “You keep the beat with the sound of the music, and I’ve had more than 100 people tell me they have no rhythm and they fall in love with the class,” Morrison says. We all hula-hooped as kids and it probably never felt like a workout, but when each hoop weighs two pounds and the hooping must be sustained for al- most two minutes—that can be a little more challenging. Hula hoops are a component of the Sig- nature HulaHoop Cardio Fit class at Allegro Pilates & Dance in Med- ford. The circuit-based workout combines high-intensity interval training, weighted hula hoops and medicine balls. “We started offering this class from the time we opened about three years ago and people immediately liked it,” says Svetlana Shapiro, owner of Allegro. “It’s child-like and fun.” During class, participants are led through three circuits with cardio and weights, and hula-hooping is actually the rest period, but it’s when the core is really working. “Besides the fun of hula-hooping, I find hooping the weighted hoop around the waist helps engage the inner core. The hoop movement doesn’t only come from the hips, it’s more about movement in the mid- waist and it does take energy to move it around,” Shapiro says. While hooping, Shapiro asks her class to move side to side or forward and backward, or they pick up the speed of hooping for 10 seconds and then slow down. The result is more fat burned and a fired-up metabolism. Working out in the water might not be the most revolutionary strategy, but new life is being injected into the pool at Royal Fitness in Barrington. While they do offer a variety of aqua toning classes that skew toward the senior population, newer options like aqua Zumba, aqua yoga and aqua bootcamp have younger demographics diving in. Aqua yoga moves through traditional poses (except for the ones where your head is down), with an element of Tai Chi. “That’s excellent in the water because you can feel the resistance on your palms and fingers through to your chest,” says Forelli. “It feels like a nice, thorough stretch.” Zumba in the water takes participants through their favorite moves, from the mambo and cha-cha to the grapevine. And for those looking for toning in their whole body, squats, calf raises, lunges and even some barre movements become more challenging without the support of a bar to lean on. Being active should be something to look forward to, not another chore on the list, and South Jersey has plenty to offer to keep you interested.